So, a handful of government scientists (whose fame and fortune depend upon scary warming) have spent years looking for evidence that the historical data is so wrong that “adjustments” are essential. In this quest, the most fertile ground has long seemed to be the retreat of New Zealand’s numerous glaciers, particularly in the Southern Alps. Way back in 1974, James Salinger had a research paper accepted by Nature in which he contended that New Zealand must be warming because its glaciers were retreating. This led on to his doctoral thesis and his eventual apotheosis – the 7-Station Series – and his focus on those glaciers never waned in the following 40 years. Through all of these, it is claimed or implied that the loss of ice volume over sustained periods provides conclusive evidence of relentlessly increasing local temperatures. The fact that this very issue has been long debated amongst glaciologists seldom receives any mention. This is highly authoritative research by Andrew Mackintosh, Brian Anderson and Prisco Frei (Antarctic Research Centre), Andrew Lorrey and Sam Dean (NIWA) and James Renwick (VUW). All six authors are senior climate science advisers to the Government. It is fair to say that they collectively represent the best available expertise regarding the characteristics and causation of New Zealand’s glaciers. In New Zealand, at least 58 glaciers advanced between 1983 and 2008, and Franz Josef and Fox glaciers advanced nearly continuously during this time. Here we show that the glacier advance phase resulted predominantly from discrete periods of reduced air temperature, rather than increased precipitation. The lower temperatures were associated with anomalous southerly winds and low sea surface temperature in the Tasman Sea region. These conditions result from variability in the structure of the extratropical atmospheric circulation over the South Pacific. In recent times, for over a quarter of a century, New Zealand’s glaciers failed to support the hypothesis of continuous warming. On the contrary, the glacier advance provides conclusive evidence of COOLING through this whole period, and these anomalous lower temperatures extended right through the region. Why didn’t this huge discovery reverberate joyously throughout the New Zealand and Australian media? Why didn’t it upend the meme that “the science is settled” and spark debate in Parliament? I can’t explain this. It just didn’t happen and the glacier paper was politely ignored. The authors begin by reviewing the literature that establishes that glacier stability is normally determined by its internal structures rather than external forces, finding few exceptions. Examples of glacier stability and expansion during the last three decades that are attributable to climate, rather than to internal glacier dynamics, are confined to just a few regions such as the Karakoram and Pamir, western Scandinavia, southern Patagonia and the Southern Alps of New Zealand. There are 198,000 glaciers in the world covering 726,000 km2 (0.5% of the world’s surface), mainly in the polar regions, but only a handful of them are useful indicators of changes in the ambient climate. As it happens, the Southern Alps glaciers do provide such a litmus test, and have done so with a vengeance during the past 40 years (which just happens to coincide with the period of anthropogenic global warming). 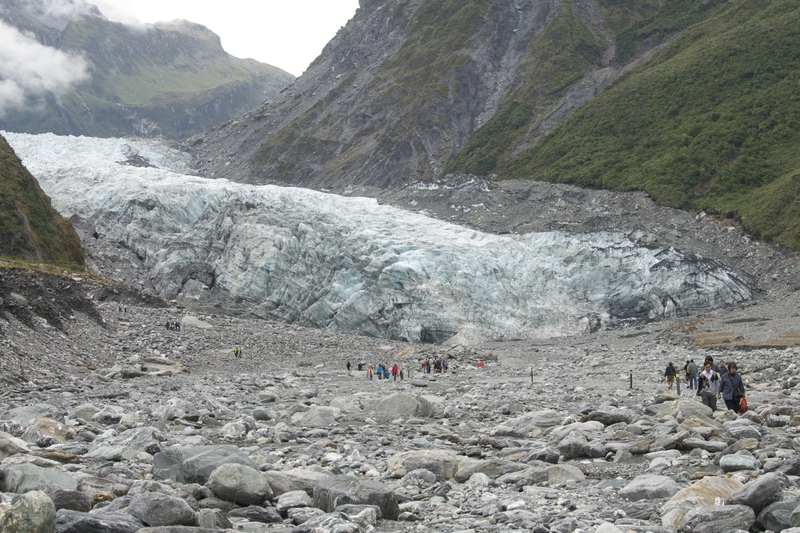 A number of glaciers in New Zealand recently exhibited a globally exceptional period of terminus advance. The World Glacier Monitoring Service database shows that 58 glaciers advanced at some point in the 1980s, 1990s and early 2000s, and 12 of these glaciers advanced continuously for five or more years. In 2005, when this glacier advance phase neared its end, 15 of the 26 advancing glaciers observed worldwide were in New Zealand. Franz Josef, the glacier with the most complete length change record in the Southern Hemisphere, advanced for 19 of the 25 years between 1983 and 2008, regaining almost half (1.4 km) of the ∼3 km length it lost between 1893 and 1982. New Zealand hosted more than half of all the advancing glaciers in the world, just 12 years ago! Clearly, something dramatic was happening. But was this growth caused by a lower melt rate or by increased snowfall? The authors note that the IPCC’s AR5 report had speculated that these “exceptional terminus advances” might be related to increased winter precipitation. The researchers found otherwise in a series of diagnostic modelling studies. Our diagnostics indicate that precipitation variability accounts for only 27% of the total ice volume anomaly during the advance phase. The experiment was repeated with wind, cloudiness and relative humidity, but the combined effect of each of these variables resulted in small (17%) changes in glacier volume, compared with temperature (56%) and precipitation (27%)… the advance of glaciers in the Southern Alps between 1983 and 2008 (26 years) was mostly due to reduced air temperature. The lower air temperatures in the mid-1980s, early to mid-1990s and mid-2000s are linked to variability in the extratropical atmospheric circulation. In particular, the influence of large-scale atmospheric waves… encouraged southerly winds in the New Zealand region, cooling the Tasman Sea and lowering air temperature in the adjacent Southern Alps. The cited ‘New Zealand temperature series’ is the original 7SS published by NIWA. The cited authority is Dean & Stott (2009) which noted that the clear trend of increasing southerlies since 1960 remained unexplained3It also found that “in comparison to the global mean, the interannual and decadal fluctuations in temperature in the New Zealand region are significantly larger” – due no doubt to Dr Salinger’s generous adjustments. but was highly correlated with New Zealand average air temperatures. The paper also explained the different significance of an advancing/retreating terminus (as with Franz Josef and Fox) versus the loss of ice volume (as with Tasman and Murchison). In Fox and Franz Joseph glaciers, the combination of large mass balance gradients and steep, relatively thin and fast-moving ice makes them adjust rapidly to climate forcing. Very few glaciers on Earth are capable of responding this quickly. The response of gently sloping glaciers in the Southern Alps contrasts with the steep glaciers. The difference is most stark for the low-angle, debris-covered glaciers that terminate in lakes, which have generally down-wasted rather than retreated horizontally… such glaciers are in decline. Because Tasman and other lake-calving glaciers constitute approximately half of New Zealand’s total glacier volume, Southern Alps ice volume as a whole has decreased since the 1980s, even though several glaciers have advanced during this period. Slow down-wasting is largely caused by ablation/melting as a result of increases in solar radiation rather than changes in temperature and precipitation. It is significant that the Modern Maximum of solar activity was very high in the mid-20th century during cycles 15-21. The greatest period of glacial melting was 1850-1940 as a result of the ending of the 300-year-long Little Ice Age. Finally, the authors found that they needed to undertake considerable tuning of their regional-scale energy balance climate model, with hundreds of actual Franz Josef mass balance measurements. Climate models do not fully reproduce the form or the timing of the distinct Southern Hemisphere regional atmospheric meridional airflow anomalies that drive large interannual variations in New Zealand temperature, and Southern Alps glacier mass balance. Future projections of New Zealand climate, and hence glacier mass balance, are unlikely to be accurate on decadal timescales unless models capture this behaviour. This paper is clearly among the most important to be found in the international science literature regarding the climatology of New Zealand. Its authors are regarded by the Government as authoritative. In nearly two years, the paper’s many findings have not been subject to challenge or questioning from any source and now seem to be as settled as this topic can ever be. Let us summarise the key areas that it illuminates. • The extraordinary advances of New Zealand’s maritime glaciers show that this region of the South Pacific has experienced significant cooling of average air temperatures during the late 20th century and early 21st century. • This cooling results from an unexplained increase in the prevalence of southerly airflows that commenced in the 1960s and continued until at least 2008. • The cooling trend is reflected in NIWA’s ‘New Zealand temperature series’ during the same period. • The long-term loss of ice volume in the large lake-calving glaciers is not indicative of temperature and precipitation changes. • The medium-term climate projections of regional climate models (including those used for all of the Ministry for the Environment’s published projections) are probably inaccurate, as they have not been tuned to reality – i.e., they have not captured the regional airflows that drive New Zealand’s temperatures. It seems that crude measures of total glacier mass balance tell us nothing about temperature levels. Only a handful of glaciers around the world serve as thermometers and the steep West-facing glaciers (not the huge ones on the eastern side) of the Southern Alps are members of that exclusive club. Anecdotally, the last frost of the winter typically occurs here in North Canterbury before Labour Day (23 October). Each of the last 5 years have seen frosts in early November, up to 2 weeks later than previously encountered in my 20 years of growing stonefruit. Just sayin’. You are confusing regional with national. NZ’s glaciers are clustered in the southern part of the country. For example, south-westerly winds over southern NZ is usually in conjunction with west or north-west winds in the North Island, which results in warmer than average temperatures in places like Hawkes Bay. James Renwick has been involved in almost all of these studies and he would be aware of any inconsistency. Individual glaciers are subject to temporary localised changes in weather patterns. You need to look at longer time scales and multiple data sources to infer climate variability. Interesting. Perhaps it’s a case of warming causing extra cooling. Yes, Barry’s done well with this. You are confusing regional with national. Three people posted comments before you: Barry, Mike and myself. Whom are you addressing? An excellent article. Please ignore Simon as he is doing that which he usually does here i.e avoiding questions of his faith, throwing up nonsensical strawman arguments and generally using up good electrons and bandwidth with what are nothing more than distractions. I would like to bring your attention to TV1 News item from last evening re the scary rate at which Antarctica is supposedly melting. The item irritated me considerably and impelled me to do some research this morning. I was unsurprised that the article had first seen the light of day in an American newspaper noted for both it’s leftward and alarmist stance before being picked up by a UK Daily Mail newspaper, then regurgitated whole by TVNZ News on One. It is interesting to note that there were no empirical studies of the quantity of ice and the rate of gains or losses before the beginning of the geo satellite era and the mathmatical errors included in the article are considerable. In short, there is no cause for alarm despite the nonsense promulgated by our State broadcaster. It Occurs to me that our major organs of state are in thrall to the UN, which disturbs me more than a little. I would be interested in your comments Richard. In 2010 I visited both Fox & FJ on my South Island sojourn. At FJ I happened to pass a group of tourists gathered around a DoC staff member who was telling them that FJ & Fox were great examples of ‘retreating’ glaciers affected by global warming! Remember this was just two years past the ‘greatest advance’ of those two famous glaciers. Yet here was a representative of the Govt. pushing the CAGW line. This struck me as odd as I had been to both of those glaciers thrice in the past, 1984, 1989 & 2001. My own photos clearly show the dramatic advance from ’84 to ’89, as well as the continued advance from ’89 onwards. On my next visit to the glaciers in 2013 I brought with me some A4 prints of each glacier from all 4 of my previous visits. By 2013 both glaciers were well into their rapid retreat, similar to that of the 50’s & 60’s BTW. Despite that when I showed several overseas tourists my photos as we walked up the valley, they were both surprised and annoyed to learn that what DoC was telling them wasn’t actually true! It hacks me off that the likes of DoC concentrated on spreading the myth rather than promoting the reality of what was happening for 1.5 decades. A rare opportunity to witness advancing glaciers at sea level in a temperate climate zone was missed by successive governments only interested in fostering lies on the world rather than admitting the plain and obvious truth. The powers that be could not countenance the idea that a large part of the NZ climate was doing something other than what they decreed was the case. There was no way that natural variability could be allowed to raise its ugly head and spoil the meme! Simon quotes ‘regional variability’ above, but is only partially right when he mentions the Fohn affect for Hawkes Bay. In a typical scenario, often seen during El Nino events like this current weak one, the approaching Nor’ West front hits Fiordland first before working its way up the West Coast. While copious rain is falling on the Neves of Fox & FJ, the east coast of the S.I. is sweltering in temperatures in the low 30C area. The whole system gradually works its way up the S.I. & onto the N.I. A lot of the rain energy is lost on the S.I. before the move across Cook Strait. Here the isobar contours steepen and the wind gathers strength, so often less rain but more wind than earlier. Now it is the east coast of the N.I.’s turn to get the high temperatures. If the depression looks a lot like a spiral galaxy from the satellites then as the clockwise rotation of the system moves further east the dominant wind direction very quickly shifts from the NW (the leading fronts)to a southerly (brought up by the lower, trailing fronts dragging up cold air from sub-Antarctica) dropping the east coast temperatures by up to 20C in less than an hour in some instances! The idea that the east coast is constantly sitting in the high 20’s or low 30’s in these situations is not realistic. I would lean toward the thought that if the area around South Westland was cool enough to support glacial advance for about 15 years then the whole of NZ was equally cooler in relative terms. No, the observed cooling of the Southern Alps was not “regional” (in the sub-national sense). Rather, this quarter-century anomaly was Regional (in the supra-national sense) and covered a large swathe of the South-West Pacific – including all of New Zealand, the Tasman Sea and S-E Australia. Yes, Jim Renwick was a co-author; and he was quite satisfied that the advance of Franz Josef/Fox described in the study was a consequence of the widespread cooling which affected the whole country (according to NIWA’s 7SS data) and the surrounding seas. Ian, I can only agree that DOC’s propaganda is most unfair to tourists. During your earlier visits they could have been told that they were witnessing a very rare sight – New Zealand then had more than half of all the (known) advancing glaciers to be seen anywhere in the world. Yesterday, two alarmed NY Times reporters wrote a nerve-shattering story about the Tuyuksu glacier in the Tian Shan range near Almaty,”melting like mad”. They say this glacier “is one of the longest studied in the world” and is indicative of what’s “occurring to 150,000 glaciers all over the globe”. I prefer to believe the Mackintosh et al peer-reviewed research paper. It says that “internal glacier dynamics” generally cause such melting, and that climate is the driver in only a handful of regions around the world. The paper names the Karakoram and Pamir ranges, pointedly omitting the Tian Shan and Himalayas which are in the same region and much better known. Why did the NY Times photograph a Tian Shan glacier (which is not relevant to temperature studies), and then gush about the similar effects which must be happening in the Karakoram? Propaganda again. I wonder whether the equivalent of our Science Media Centre gave them a grant for writing a scary climate story? Barry, I think that Doc’s propaganda is not only unfair to overseas tourists, but also to us tax payers who foot the bill for everyone in that Government Dept. I say this as a former Executive Board Member of the PSA that covers such workers (not at that time BTW). I represented Local Govt for 18 months a bit later on, before I left to go back to private enterprise where I am now. It more than disappoints me that successive governments seem to have paid little attention to the advocacy being perpetrated by Govt. funded entities. It shows how much they really care, until they are challenged. In my view, civil servants have a legal obligation to appear to be absolutely without bias on any topic of national or international iimportance, whatever their personal feelings or understandings may be. Behaving like spoiled brats or know-it-alls is simply unacceptable. Thanks to those who provided a link to WUWT re glaciers. That excellent site has been on my list for ears when I am researching contentious statements from true beievers in fairydust and other makebelieve phenomena. This is the chart that you should focus on. Look at how the Tasman Glacier has steadily declined over time. Look at how Fox and Franz Josef have also declined, despite the advance in the 1983-2008 period. It is the overall trend that is important, not the variability. This paper discusses the variability as it is useful to understand that coastal, steep, thin and fast-moving glaciers like Fox and Franz Josef are more sensitive to weather pattern changes than alpine glaciers with significant terminal lakes like the Tasman. James Renwick and Jim Salinger are neither dishonest or biased. You are misinterpreting the research. Simon, how can it be that a period of 15 years of natural variability can be so insignificant in the ‘long term trend?’ If CO2 is THE major player in climate change as the people you support claim, then the 15 years of regional cooling could not have occurred! The Tasman Glacier and the majority of those on the eastern side of the divide are obviously fed by a different regime than FJ & Fox, a regime that may not have occurred for well over 100 years as far as I can tell. It never ceases to amaze that people like Trevor Chinn & Jim Salinger can stand there and harp on about the comparatively minor amount of glacial ice lost since the 1970’s & attribute all of that loss to human kind, when put up against the far greater volume lost to nature between 1867 & 1950, when human industrial activity was not deemed to have played a part in the proceedings according to the IPCC who claim our influence came after that! CO2 concentration in 1867 was 287 ppm, 1950 was was 311 ppm. Temperature anomaly was around -0.5C in 1867, and 0 in 1950, so most of that ice loss was anthropogenic in cause. The myth that there was no anthropogenic warming prior to 1950 is yet another wilful misunderstanding by people who should know better. The myth that there was no anthropogenic warming prior to 1950 is yet another wilful misunderstanding by people who should know better. You may be right. But there’s one thing missing from your assertion that’s important to your argument. Simply stated, what’s required is some evidence that the warming was caused by human emissions or activity. Why is it a myth? The IPCC are pretty cagey about it. They state “most of the warming since 1950 is likely to be human caused” or similar. Where do they mention pre-1950s warming? Simply stated, what’s required is some evidence that the warming was caused by human emissions or activity. There is no credible alternative hypothesis for the changes that we are observing. So, Simon, the IPCC can’t blame us directly for pre-1950 warming, but because you, and everyone else that thinks like you, can’t identify what natural processes caused the LIL and the rebound from it, then it must be us! How unscientific of you. Therein lies the problem. We only think that we know how the climate works. In reality we are only at the beginning of our journey of understanding the climate. Many theories and ideas will fall by the wayside as this unsettled science advances. Those with preconceived ideas will be found in the dustbins of scientific history. The question “what might it be?” is not what’s called proof. Try to get that into your head. We have known for more than 120 years that increasing atmospheric greenhouse gas concentration will cause the climate to warm. The theory predicted an outcome that has subsequently occurred. The theory is validated. You have a theory? What is it, where was it published? We have a theory that pizza makes you fat. We see an increase in obesity. They [the IPCC] state “most of the warming since 1950 is likely to be human caused” or similar. Where do they mention pre-1950s warming? Human activities are estimated to have caused approximately 1.0°C of global warming above pre-industrial levels, with a likely range of 0.8°C to 1.2°C. And figure 1.2, which clearly shows anthropogenic warming since about 1880. So even though we don’t have a specific attribution statement for the whole period (like the one from 1950 onwards), they seem to be saying that roughly ALL of the observed warming is anthropogenic. At least people (Ian Cooper, I’m looking at you!) should stop saying that the IPCC says there was no anthropogenic warming before 1950. Research into earlier periods of warming in the 19 th & 20th Century has been a neglected field in the last couple of decades. Check out some of the thoughts in this recent offering from Judith Curry. I suspect you didn’t even read what was in the link I gave above. Reading Judith’s post is unnecessary since the first paragraph claim is just plain wrong. RT and the “self-taught” noddies at WUWT have the excuse that they don’t have the scientific training to discern fact from fiction. Judith doesn’t. You destroy your own argument. You ask us to read a rebuttal but refuse in the same breath to read what you scorn. If you were informed of her reasoning, you could answer her cogently rather than with mere antediluvian grunting. Might persuade someone to change his mind, where grunts don’t work. Reading Judith’s post is unnecessary since the first paragraph claim is just plain wrong…..they don’t have the scientific training to discern fact from fiction. Judith doesn’t. Perhaps it is unnecessary to bother responding to my comments as clearly my scientific training isn’t up to scratch.